The following list contains the most recently added items charged to Law and Justice, and the list is refreshed on a nightly basis. If you see a title that the library does NOT have, please contact Mr. Maley, the subject specialist or fill out "Please Buy This". This guide was prepared in consultation with Dr. Charlotte Neff of the Law and Justice Department. For information about Laurentian's Department of Law and Justice and the courses it offers, please visit the Department of Law and Justice's web site. The purpose of this guide is to recommend print and electronic resources for conducting research in Law and Justice in the Library. Click on the links on the left for suggestions about starting your research, getting books and articles, and finding other useful tools for research in Law and Justice. Most of the Library's online resources are available to you from anywhere off campus. See: UL Proxy Accounts. I am available to help you throughout the academic year. If you would like to arrange for an individual appointment, please e-mail me with a requested date and time, and a brief description of your project. find as many synonyms as you can for each main concept. You are now ready to start searching in the library's catalogue and databases. When you are looking for definitions or if you don’t know much about a specific subject, reference works such as dictionaries and encyclopedias become invaluable because they contain relatively short—and understandable—articles. These articles often lay out the parameters of a subject and can assist you in trying to narrow your topic. Often such articles are accompanied by lists of readings (bibliographies) which allow you to explore your topic further. The best general encyclopedia is: Encyclopedia Britannnica. Black's Law Dictionary. 1979. (Print). To find more using the catalogue, click on the subject heading: Law--Dictionaries. Dictionary of Canadian Law. 2004 (Print). To find more using the catalogue, click on the subject heading: Law--Canada--Dictionaries. 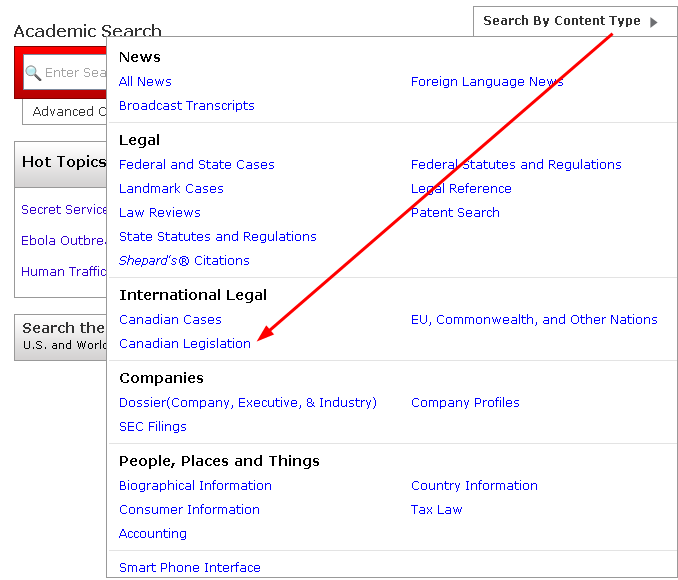 Canadian Law: Duhaime's Law Dictionary Under "Legal Reference" at top of screen, click on Law Dictionary Index. If you need to find an article--and you have the full journal citation--then you can often get to it quickly using Electronic Journals (A-Z). Type in the name of the journal, click on the correct journal name, click on the appropriate year / volume / issue, then find your article on the list by starting page number. 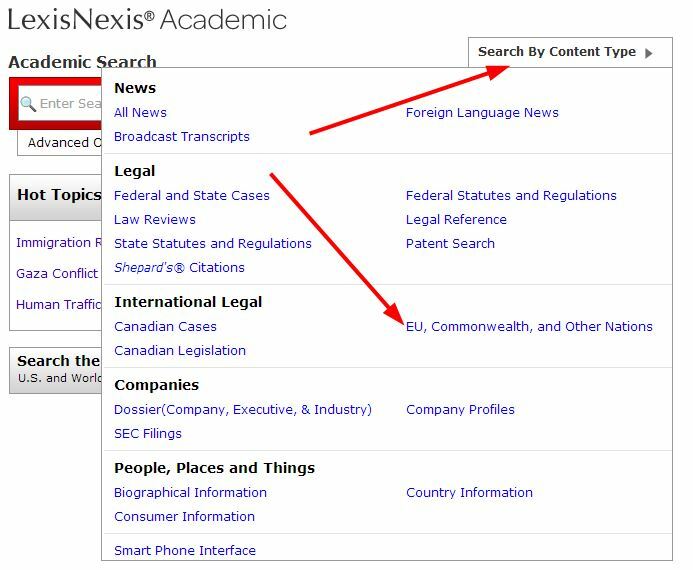 Please note that you cannot use the A-Z list to search by subject or by article title--the list only supplies access to known electronic journal titles. When you click on that, you will arrive at a menu which will lead to an electronic copy of the article you want, or, if not available electronically, to Laurentian's catalogue which will allow you to check if the article is available in print in the library, and if not, to a final link which allows you to order the item through Interlibrary loan. CanLII provides access to primary Canadian legal material by jurisdiction, federal and provincial, including the full text of judgements as issued by courts, as well as a large number of Boards and Tribunals. To determine how far back judgements exist for each court or tribunal click on any jurisdiction in the left menu, then click Scope of Databases. 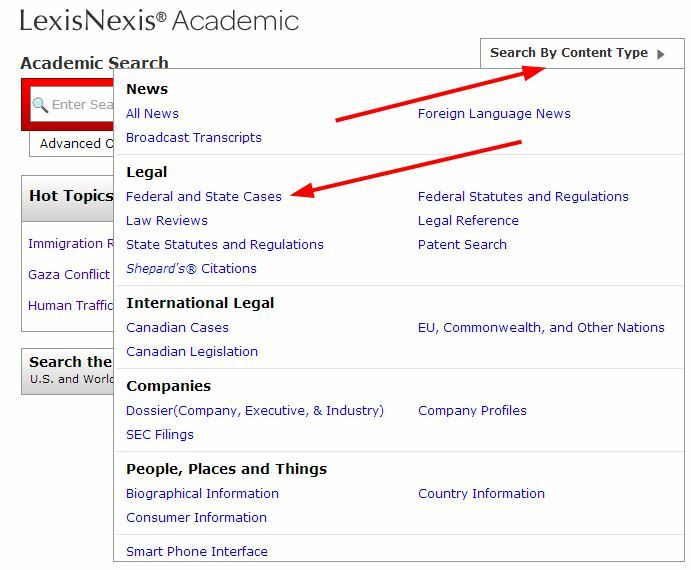 To search the judgments again click on a jurisdiction, and a search dialogue will appear at the top. Court cases since 1876. 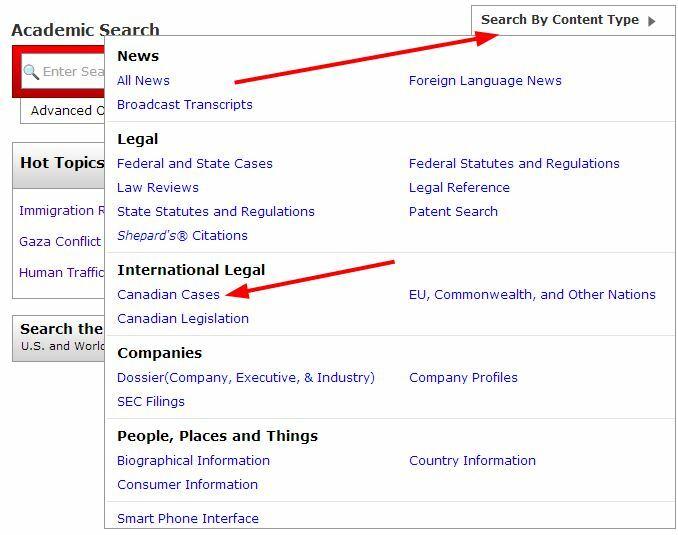 To find, click on "Search by Content Type>" and then under "International Legal" choose Canadian Cases. Includes English Reports, Full-Reprint (1220-1867). This collection contains over 100,000 cases, representative of 265 separate series of Reports,arranged by Courts. Includes cases from most Commonwealth countrties. All England Law Reports from 1936 and other law reports from 1945. Northern Ireland cases from 1945. Unreported cases from England & Wales, Scotland and Northern Ireland from 1980. CanLII provides access to primary Canadian legal material by jurisdiction, federal and provincial, including current legislation and regulations. Federal legislation is also available at: http://laws.justice.gc.ca/en/ and Ontario provincial legislation at http://www.e-laws.gov.on.ca/. Current Federal Bills are available at http://www.parl.gc.ca/ and Ontario Bills at: http://www.ontla.on.ca. In Hein Online, the Session Laws Library provides access to federal legislation not only from Canada (1792 to within a year or so), but to Australia (1901 to a year or two), the Bahamas (1968-1996), the United States (1789 to three years ago) and to all states (19th, 20th and 21st centuries). Get the most current US law by clicking on Search by Content / Legal / and then, deparending upon your requirements, Federal Statutes, Codes & Regulations, or State Statutes, Codes & Regulations. See screen shot opposite. Doing Legal Research in Canada An introduction to the topic written from the perspective of an American. Some items are licensed for use by members of the Laurentian University community; use by others may be restricted. are available to Laurentian University members who wish to use licensed products from off campus.